Nature vacation to the coast of Pontevedra and Vigo? : City on a Ría without many highlights but with religious monuments (Iglesia de la peregrina) in the car-free center of town. : Largest and most modern city in Galicia with few monuments but some museums. Known nautical center for the Rias Baixas area. : City separated from the border with Portugal by the river Miño and connected by a bridge of Gustave Eiffel. The center offers an intimate atmosphere, on top of the hill stands a cathedral which look more like a fortress. : Very beautiful island group in the Rias Baixas. In 2007 the beach of the island Monteagudo was voted as the most beautiful beach in the world. Boats from Vigo go in the season to the islands. : Peninsula with many luxury hotels, the island A Toxa is known for a church covered with large shells and is connected by a bridge. Soon Pontevedra webcam, blogs, travelreports, spanish recipes and movie locations. 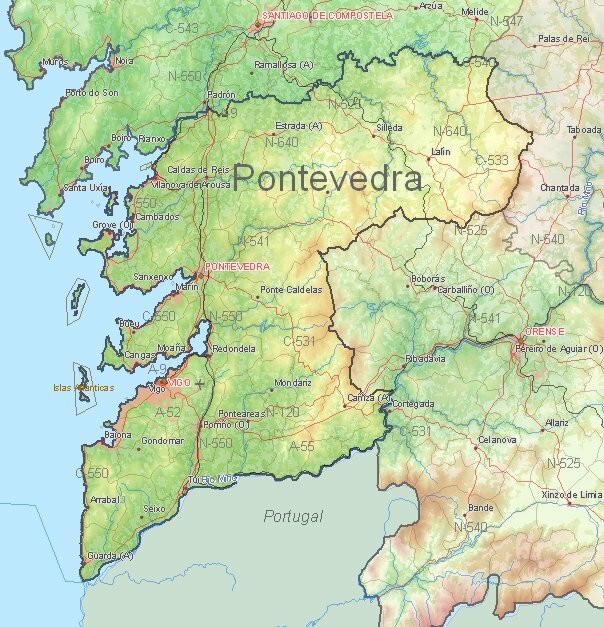 1) Current weather in Pontevedra (temperature, precipitation).